Hi-Lok and Hi-Lite Installation Ratchet Assembly from Omega Technologies includes: 1/2'' Socket, 5/32'' Hex Key. 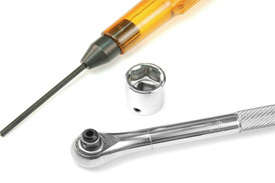 This is a hand tool assembly for the installation of the Hi-Lok or Hi-Lite fastening systems. It consists of a Roller Ratchet wrench with a through hole, a socket, and a plastic handle Allen wrench.